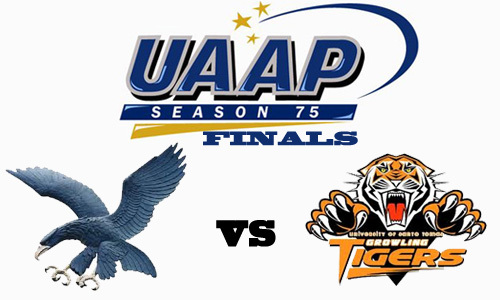 In this UAAP 75 game 2 match showdown between Ateneo Blue Eagles versus UST Growling Tigers will reveal the champion of this season. Do you think that the four-time champion Ateneo Blue Eagles will still be the one? or there will be a new champion this year? Find it now here after you scroll down this page. Ateneo Blue Eagles has already 1 point in first game finals while the Growling Tigers need to win this game 2 of the UAAP Season 75 finals in order to have a chance to win as Champion. Before the UAAP game start, they will announce first the winners of the season's individual awards, including the members of the Mythical Five, the Rookie of the Year and the Most Valuable Player, the awarding ceremonies start at 2 p.m. The good news is, you can watch the game play of Ateneo Blue Eagles vs UST Growling Tigers live at Studio 23 and to a live streaming of UAAP 75 Official site - http://uaapsports.studio23.tv/livestream.html. Saturday, October 11 at 3:30 p.m. The video or live stream is not intended to be copyrighted it is only embedded here to be shared. See my Disclaimer at the footer section before you watch the video or live streaming. You can also view the links below for more information about UAAP season 75. Comments or suggestions about "Ateneo Blue Eagles vs UST Growling Tigers UAAP 75 Game 2 Live Stream" is important to us, you may share it by using the comment box below.